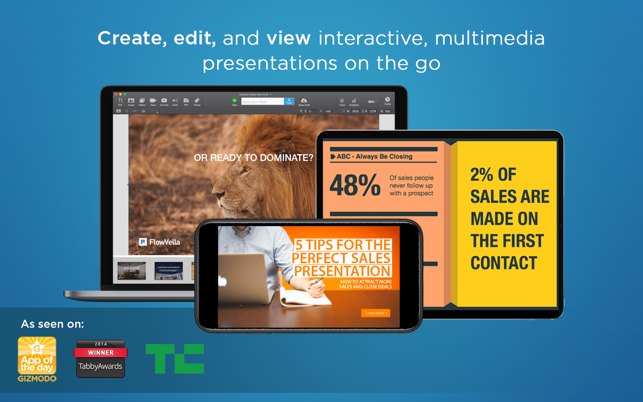 Gets better results with the presentation app built for today. Engage your audience in one presentation experience. turn your story into an interactive conversation. Build on Mac, present (and edit) on your iPhone/iPad. 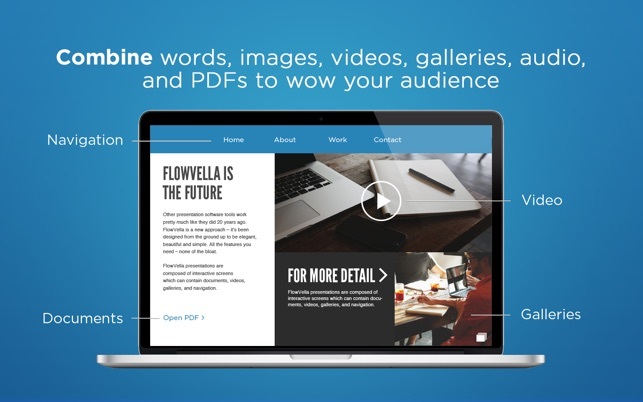 FlowVella allows anyone to quickly and easily create beautiful, interactive presentations with images, sounds, text, videos, PDFs, links and photo galleries and post them to the web to share with anyone on any device. 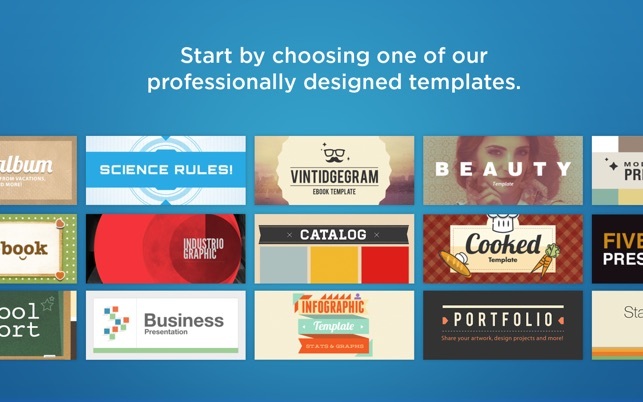 FlowVella is bundled with over 30 professionally designed templates for: creative presentations, pitches, portfolios, school reports, video presentations, photo galleries, memories, real estate and so much more. When you start creating a Flow, you can choose from our catalog of handcrafted and beautifully styled templates. Because your Flows are saved in the cloud (AND SAVED LOCALLY), you never have to worry about having access to your presentations. Need to present, but forgot your Mac or iPad at home? Hop onto any computer and pull up your work in seconds! In addition, our web player makes it possible to share your presentation with anyone, whether they are a FlowVella user or not. If you choose to, you can share your work with anyone on any device - no account or special app is required to view Flows. Each Flow gets a unique short URL (web link) you can share. Or keep private. 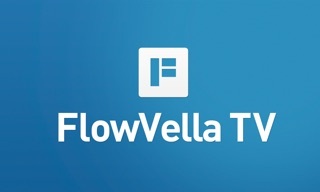 FlowVella offers several privacy levels so your content can only be seen by those with whom you wish to share. Public, password protected and "Team privacy" with PRO. You are in complete control of your presentations with FlowVella's privacy settings. FlowVella for Mac comes with the ability to post 4 public flows. 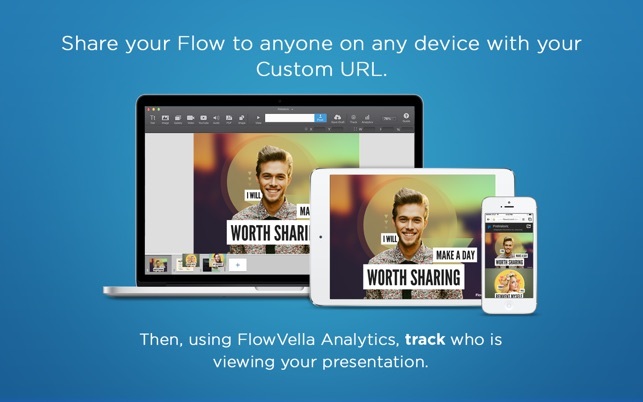 FlowVella PRO gives you unlimited presentations and screens, and gives you bigger file upload sizes, allows you to add a password to protect your Flows, presentations analytics and alerts, create teams and much more. PRO is available through an auto-renewing subscription for $19.99/month or $199.99/year. Optimized for Mojave, we've fixed and updated multiple screens and views to ensure FlowVella works perfectly with Mojave. UI changes that are both discreet and important. *The 'view' button in the creator is now green, looks so much better. *The 'Create your Flow' button is now a circle matching the look of the FlowVella iPad and iPhone app. While we can't claim Dark Mode, our gray and white look compliments well your Dark Mode experience. Many bug fixes and performance updates. I paid for it, now they want me to pay again. I bought the app for a one time price, now I find that they just kept the money and expect me to pay monthly. I thought that's exactly what the App store was supposed to protect against. I got literally zero for my money. Every update keeps getting better: This is the best app ever. It took my basic training tools and enhanced them to be the 2014 material people and students should be seeing. Interactive and engaging. The developers are quick to respond and very helpful. 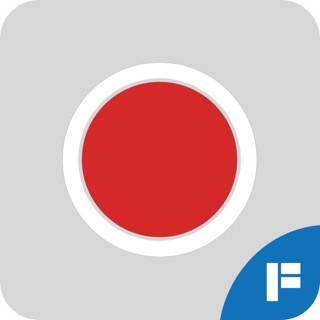 I will never present the same again :) This app will change the way you present. It does everything I expected and more. 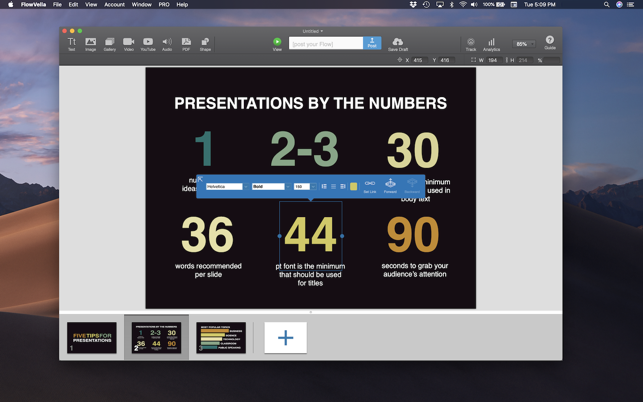 This will be my go to presentation software for years to come. Trust me when I say FLOWBOARD is the BEST! If you are giving this app less than 5 stars then it may be user error. Just email the developer and they will help you if you have an issue. Plus they want their product to be a good one :) Teachers can create interactive openhouse or back to school night presentations for parents and students. You can engage your students in your lesson when they are absent and or need more help. Business owners or people who are self employed can make business cards with the flowboard address on it, so that people can always access your flowboard and you can always change/update your information so that it is current :) This tool can even be used as a resume! Artist can display their work of art. Just a genius group of developers and it works wonders for me. It is worth every penny. I LOVE FLOWBOARD! Do you want distant and powerful Presentation Decks? I think that the most important aspect of this software is that it comes on a variety of platforms - and I find that on any given day I am using a smartphone, an iPad, Leap Motion or the ‘ol laptop. And this software works seamlessly on all of them - those of you reading this know that this feat alone is rare in the software world. Flowboard has set my various weekly presentations off - in a very positive way - from others in the room. It allows my clients and fellow faculty total engagement and the ability to work with any of the material in a nonlinear way - fantastic. Can it be improved - of course and I have seen the progression of improvements over these past months - allowing me… one or more new features each time that I actually didn’t know I wanted… So I am writing this as a “wow… one more platform” commentary. If you’re a newbie on this - test it out… play with it… select buttons/actions and if things kind of blow-up in front of you… try a different angle… this is a fun platform. Bottom line - this is a cool product!